Blacksmiths Post Drills, Acme, Champion and Buffalo Forge. Compare the prices on these machines. The bigger industrial model sells for roughly 10¢ a pound while the smaller standard blacksmiths drill sells for 6¢ a pound (weight 120lbs). Today machinery typically costs $4.00 to $6.00 a pound (about 100 x). On the industrial model above, the loose pulley turned freely and was where you slid the flat belt to disengage the drill. The tight pulley did the driving form the line shaft driven belt. This made for an extra long shaft (about 6 to 8 inches). I have two of the blacksmith's style drills. They are Champions and are very similar to the Acme. These drills came in a large variety of types. Mine have the common ratchet wheel feed mechanism. Some have geared screw feed mechanisms suitable for boring. Other variations include relocatable hand crank/gear for different speed operations and rectangular section flywheels for the addition of a belt drive. I think most of these machines were black Jappaned (thin black lacquer). Both of mine were black where they had paint. The smaller is still original black. Although I stress modernizing the blacksmith shop there is nothing wrong with the old machines if you cannot afford a drill press. I put NEW Jacobs chucks on both my drills and they became instantly useful machines. These old drills have the perfect features for drilling steel. High feed pressure and low RPM. This results in long cutter life. 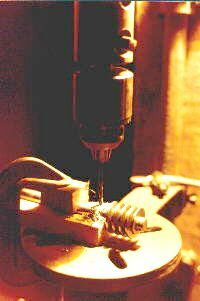 Most electric drills turn too fast for drilling anything but the smallest holes. Commonly available department store brand drill presses turn too fast for anything over a 1/2" (13mm) drill in soft steel. For stainless, annealed spring and tool steel these should be limited to 1/4" (7mm). I've drilled holes up to 3/4" (20mm) in steel with a hand crank Champion drill press. This is where you really learn to appreciate horsepower! POST DRILL SHOP HINT: When adding a drill chuck you use up some of the column length (3-1/2" - 9cm). On one of mine I replaced the column with a longer piece and put a support bracket on it at chuck height to keep the extra length from becoming too springy. The column is standard size mild steel shafting and a piece can be had (cut to length) from most machine shops for a few dollars. The middle support is a blacksmithing or welding project. I also added grease and oil cups to this particular drill. Drilling a worm gear and shaft with a hand crank drill press and wooden V-blocks. B&W images, pages 32, 70. Reprint of the 1915 Sears, Roebuck and Co., Tools Machinery Blacksmiths' Supplies catalog. Originally reprinted by the Mid-West Tool Collectors Association in 1984 and ABANA in 1985. Color image, photos (c) by the author.